Da Vinci’s Treasure (or ‘John Hunter and the Secrets of Da Vinci’s Treasure’ if you want to give it its full title) appears, at first glance, as if it is going to be yet another clone of a “Book of” slot as the hero is yet another Indiana Jones look-a-like much like Rich Wilde from Play ‘n Go’s Book of Dead. The slot also contains a spell book as a symbol, golden bling and a quest for treasure. We’re happy to say, however, that this is where the similarities end at Da Vinci’s Treasure is very much its own game. The game has a 5x3 reel set with 25 fixed pay lines and is highly volatile in nature. There are several scatter features including a hugely lucrative progressive free spins round. Da Vinci’s Treasure comes with an RTP of 96.53% and you can spin from between €0.25 and €125 a time. The Da Vinci’s Treasure game board has an ornate frame and the symbols sit on a dark red background, while behind the game board you see maps, compasses, ropes and other explorer/adventurer items bathed in the glow of candlelight. All the while a suitably tense and mysterious tune plays in the background. The tune gets more upbeat and heroic when you spin the reels, however. The design isn’t anything we haven’t seen before, which is a shame, but it is by no means terrible. There are six low-value symbols represented by 9 –A and five higher value symbols; a crossbow, a model of Da Vinci’s helicopter, a bejewelled backpack, a book, and John Hunter himself who is the highest value symbol worth 32x bet size for 5 on a pay line. Da Vinci himself makes an appearance as the wild symbol which appears on reels 2-5, and the scatter symbol is a golden cryptex (a portable cylinder vault used to hide secret messages), and this only appears on reels 2, 3, and 4. As ever with Pragmatic Play, there are a number of special features in Da Vinci’s Treasure and they are all triggered by the scatter symbols. There is a Prize Picker, a Map Quest Feature, and the big daddy of them all, Progressive Multiplier Free Spins. 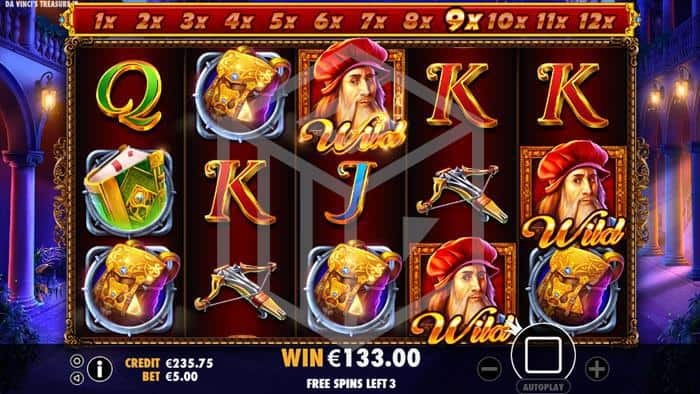 Land three scatters on reels 2, 3 and 4 and you will trigger the bonus. Before you start the bonus the cryptex will spin and come to rest on one of the three bonus rounds mentioned above. There is also a gamble feature after each of these bonus rounds have played out. 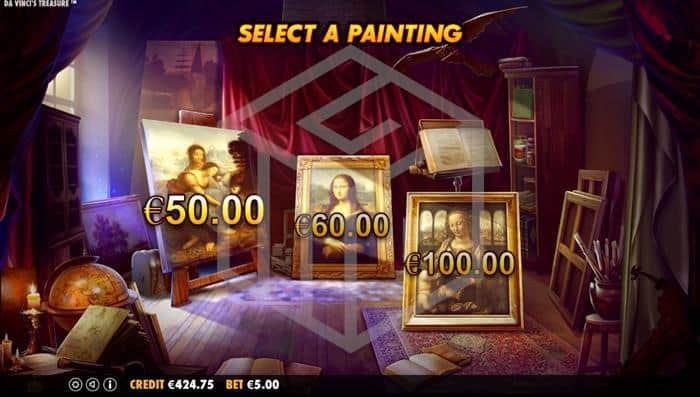 If you land on Prize Picker you’ll be transported to a room with three of Da Vinci’s pieces of art, each of which carries a hidden cash prize. Choose wisely and hope to pick the highest prize. Here you’re taken to a start of a pathway which ultimately leads to Da Vinci’s treasure. There are 23 points along the way and you must navigate as far as you can by spinning a wheel of fortune to the left of the screen which can land on the numbers 1 through to 5 or on ‘Game Over’. Each point along the way rewards you with an increasing cash prize. Map Quest ends when either you spin ‘Game Over’, whereby you’ll receive the last cash reward you landed on, or if you reach the end of the 23 points. This is the one you hope you land. If you do then you’ll be awarded 12 free spins, and with each spin which passes an additional multiplier will be added to your win. By the time you reach your final spins, you should be raking in some serious cash if you land any sort of semi-decent win. You can also retrigger these free spins up to five times if you land 3 scatters in any one spin. 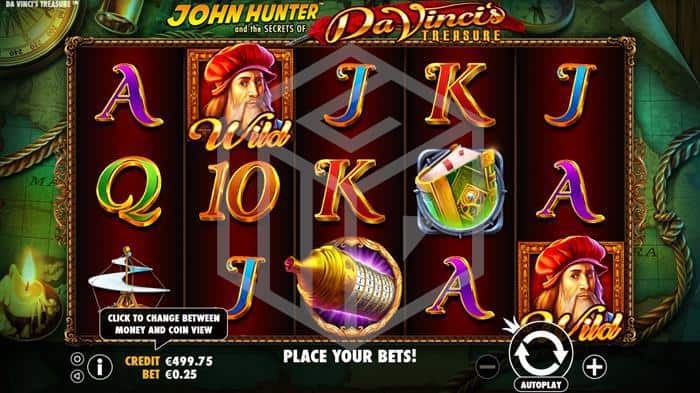 Given that the highest value symbol (John Hunter) appears stacked on the reels it is theoretically possible to land a full board of John Hunters whilst on the 12x multiplier and earn 9,600 times your bet size. After each of the above bonus rounds, you will be given the option of gambling your winnings. You can gamble between 2-5 times your win. If you choose a 2x gamble then you must choose from 2 boxes, one of which will double your winnings and one which will lose your winnings. A 3x gamble would mean choosing the correct box out of three on display etc. etc. 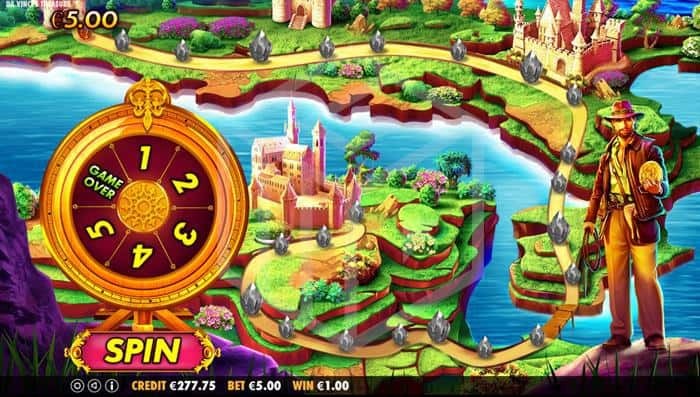 Therefore, taking the theoretically possible win example to its ultimate, if you manage to win with a full board of John Hunters on a 12x multiplier with free spins and then win a 5x gamble you COULD win a ludicrous 48,000 times your stake. If played at the highest stake this would pay €6,000,000. Nice to dream but let’s face it, it’s never gonna happen! Despite a not especially original theme or design, we thought Da Vinci’s Treasure was a cracking game from Pragmatic Play. Fearing a tedious “Book” clone it was a delight to discover a fresh take on a well-worn theme. The features are all decent but of course, it’s the free spins you’ll really be playing for, and having landed them a few times during testing I can attest to the fact that they really do pay out. If you end up with less than 100x your stake then you’ve had a bad round. Of course, as this is a high variance slot you might have to tighten your budget and play low for a while as those scatters don’t come around too regularly, and when they do you are by no means guaranteed to get the free spins. If you do, however, then drinks are on you!